We’re so proud to continue supporting long-form writing through apt–and we’re especially proud of our latest issue, featuring fiction by Michael Keefe and Anna Carolyn McCormally, and poetry by John Bonanni, Aaron Brown, and Danielle Mitchell! Copies are now available, and if you’re in Boston, you can pick one up on Monday, February 5 at Porter Square Books, when we’ll have John Bonanni, Gillian Devereux, and Krysten Hill reading from issues 6-8! The reading is free and open to the public, so bring a friend, get a warm drink, and help us celebrate these writers and their dedication to nuanced, in-depth writing. Don’t forget to RSVP, and we’ll see you in February! John Bonanni lives on Cape Cod, MA, where he serves as editor for the Cape Cod Poetry Review. He is the recipient of a scholarship from the Fine Arts Work Center in Provincetown and a residency from AS220 in Providence, RI. His work has appeared in CutBank, Assaracus, Verse Daily, The Seattle Review, Hayden’s Ferry Review, and Prairie Schooner. Gillian Devereux received her MFA in Poetry from Old Dominion University and directs the writing center at Wheelock College, where she also teaches creative writing. She is the author of Focus on Grammar (dancing girl press, 2012) and They Used to Dance on Saturday Nights (Aforementioned Productions, 2011), and her poems have appeared in numerous journals, most recently The Midwest Quarterly; The Rain, Party, and Disaster Society; Sundog Lit; Boog City; and Printer’s Devil Review. Gillian likes robots, knitting, small woodland creatures, film noir, gin, and the library. Krysten Hill is an educator, writer, and performer who has showcased her poetry on stage at The Massachusetts Poetry Festival, Blacksmith House, Cantab Lounge, Merrimack College, U35 Reading Series, and many others. She received her MFA in poetry from UMass Boston where she currently teaches. Her work can be found or is forthcoming in apt, Word Riot, The Baltimore Review, Muzzle, PANK, Winter Tangerine Review, Take Magazine, and elsewhere. She is the recipient of the 2016 St. Botolph Club Foundation Emerging Artist Award and her chapbook, How Her Spirit Got Out (Aforementioned Productions), received the 2017 Jean Pedrick Chapbook Prize. Presented as part of the Roundtable Reading Series at Porter Square Books, sponsored by Journal of the Month. 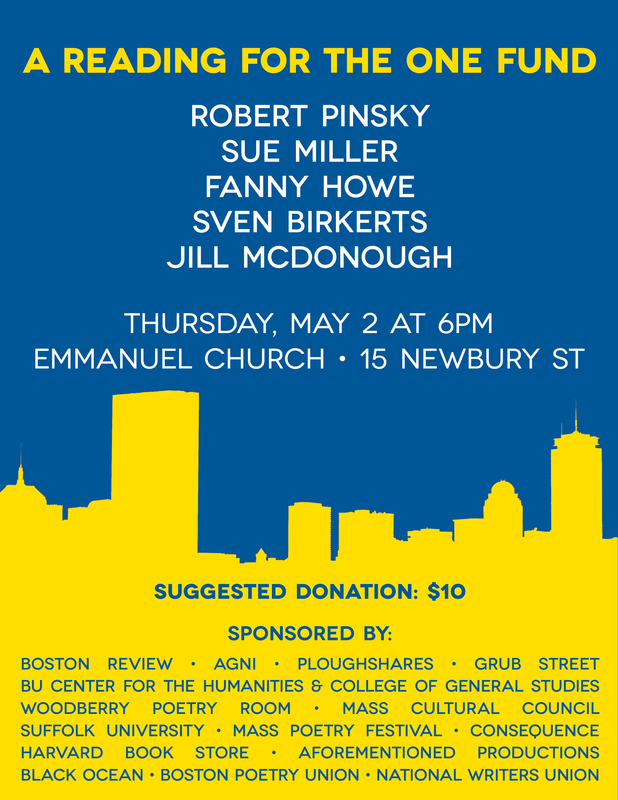 Boston Cultural Council grant + two readings at Brookline Booksmith! If you didn’t know, Aforementioned Productions is based in Boston. We’ve lived in a few cities now (Boston, New York, Baltimore), and Boston has our heart. 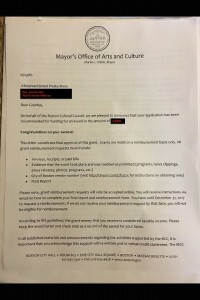 So, late last year, we had immense pleasure of receiving news that we’ve received an organizational grant from the Boston Cultural Council for 2017. It covers a small portion (5%) of our operating costs, but it still feels rewarding to be recognized by this city that has meant so much to us. 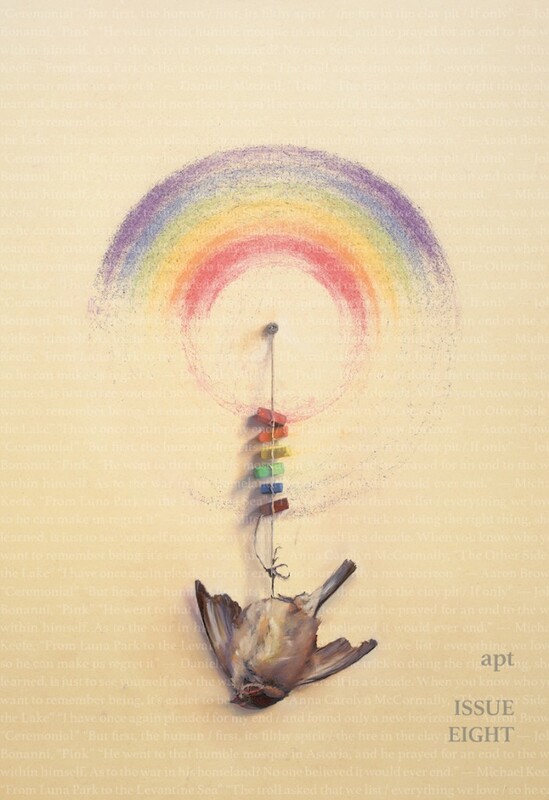 The best part of that grant is that we’ll get to spend it on all the great authors and performers whose work we want to support, like Krysten Hill, whose galvanizing new chapbook, How Her Spirit Got Out, is already in its third printing. She’ll be reading next month at Brookline Booksmith with Ben Berman, so if you’re in Boston, and you missed her release party and her inspiring reading at the Boston Public Library for the GB Writers Resist event in January, you won’t want to miss this event! 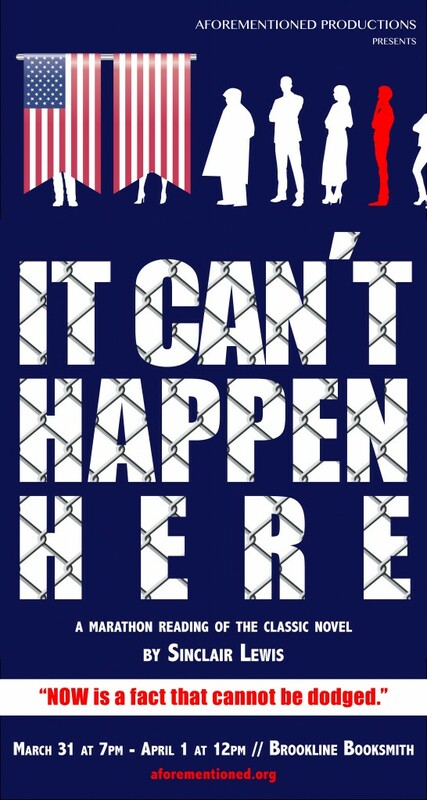 Also, because we love the crew at the Booksmith, we’re especially excited to announce that they’ll be hosting our marathon reading of It Can’t Happen Here! So, please join us for an event of literary resistance when the fine crew at Brookline Booksmith will be hosting us overnight, March 31 at 7pm-April 1 at noon (ish). Readers include AP founders Carissa Halston and Randolph Pfaff, as well as Shuchi Saraswat, Josh Cook, Catherine Parnell, Kurt Klopmeier, Karen Locasio, Alexandria Marzano-Lesnevich, Aaron Devine, Maria Hugger, Julia Kennedy, Sam Cha, Simeon Berry, and more! This event is free and open to the public, and will involve resistance, subversive classic literature, a table of books you’re going to want to buy, plus free cupcakes (and probably wine). So, join us at Brookline Booksmith at the end of next month and stay up all night while we read Lewis’s sharp-sighted and sharp-tongued classic about one journalist’s fight against fascist America. Just four days left until our production of White Rabbit Red Rabbit comes to OBERON! The show has been described as “a thoughtful, playful response to oppression” in The Guardian, and we’re taking that as a necessary reaction to the results of our recent election. 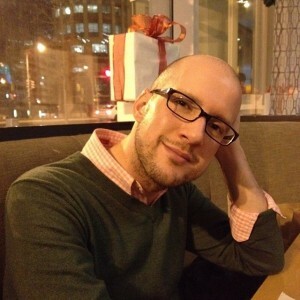 We’ve got one more cast member to catch up with: AP cofounder, Randolph Pfaff. You hold the key to this production—as stage manager, you hold the script. What does it mean to you to wield that sort of power? When we started this project, I approached you to perform and, initially, you said yes. Then you changed your mind (and broke my heart). Will you talk a bit about those choices (and how you’ll make it up to me)? Well, I’m clearly more suited to heartbreaker roles and since I couldn’t guarantee what sort of leading man I’d be in this show, I had to decline. In all seriousness, there were two reservations that led me to decline: 1. I don’t perform often, though I read my work now and then. Because the only real preparation that’s possible for White Rabbit Red Rabbit is to be comfortable on stage—physically, emotionally, and creatively—I didn’t feel like I’d be able to give it the performance it deserves, and 2. In the current sociopolitical environment of our country, I couldn’t see filling one night of a three-night run with a white male performer. There are so many actors who can bring cultural and experiential context to this show that I can’t. I don’t think putting a white guy on stage by himself in Harvard Square and having him talk for 90 minutes is doing much to shift perspectives and open people up to new ideas and conversations, which are what we need now more than ever. I’m happy to listen and learn and participate rather than driving the conversation. To answer the second part of your question, I suppose, in keeping with the spirit of the show, I’ll have to surprise you with something to make it up to you. I’d be a hypocrite to judge the too-needy among us, so I’m going to do whatever I can to ensure that all three of you can get up on stage and just go for it. I think the best thing I can do is to give each of you the confidence that you won’t need to rely on anyone or anything other than yourselves once you’re on stage. Even though “Productions” is half of Aforementioned’s name, only a handful of people know we started out as a theatre company. How do you feel about this return to staged work? I’m excited that we’re getting back to producing theatre by doing something really challenging. It’s an art form that has the power to entertain, engage, and educate without being overtly didactic. I think most audience members have a fluid relationship with theatre and are far more willing to take a risk by immersing themselves in a new experience. In return, playwrights and performers are able to break rules and blur boundaries because the audience has consented to a kind of openness and acceptance they might not be willing to give in other contexts. 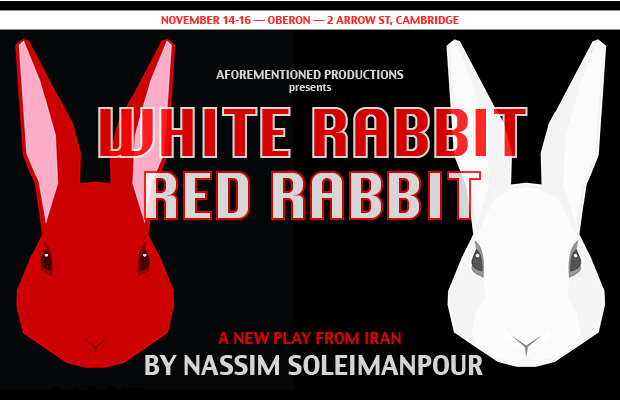 If you were to talk up White Rabbit Red Rabbit to people on the street—without saying top secret, once in a lifetime, or experimental—what would you tell prospective audience members about the production? I’d tell them that we’ve been getting too many bad surprises of late and that this show is the opposite of that. I’d say it’s a reminder that there are spaces in which we can go out on a limb without fear that the branch will break beneath us. Last question: Part of the fun of performing and producing this show is the risk: the whole thing runs on potential and we won’t know what’s happening until we’re in it. As a writer and a visual artist, how does the unknown figure in your work? This might be the perfect show for me to be a part of because I’m totally infatuated by the ways in which we approach the unknown. In my work, I’m most interested in the process of teasing out what I can’t define or articulate rather than defining and articulating it. We spend our whole lives trying to figure out who we are and how we relate to other people and how we fit into the larger world, but it’s the attempt itself that shapes who we become. We’re defined by the practice, not the conclusion, and the practice is an ongoing, loving embrace of the unknown. Read about the rest of the cast at the WRRR page, and to reserve your seats for the show, head over to OBERON!